If you need to print something confidentially to pick up later, or have a password protected print job on you Sharp printer, here are some simple instructions on how to do this task. Sharp confidential printing is pretty straightforward and simple. Once you do it a few times it will become second nature. It’s a 2 step process. First, in your print driver. Then at the Sharp’s touch screen panel. When printing, click the Properties or Preferences button to open the print driver properties. Move to the Job Handling tab and check off the Retention button and enter a password. If you just want the machine to hold the job you can skip the password. Send the job. 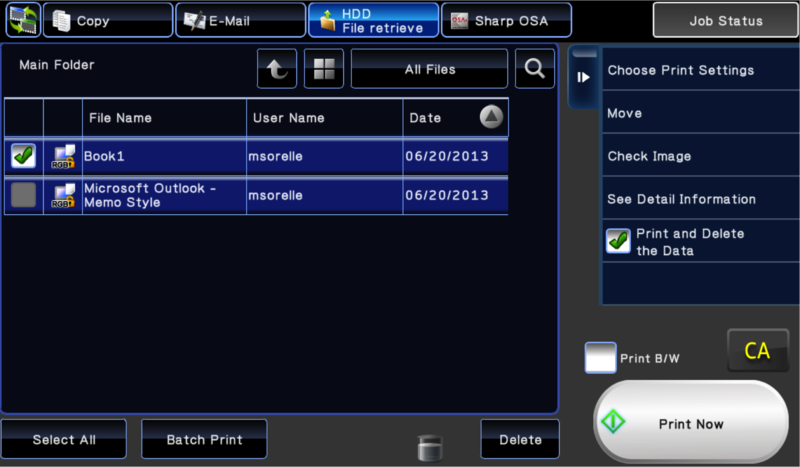 Go to the Sharp touch screen and touch either Document Filing or HDD File Retrieve. Your screen may differ from the picture below but it will be similar. Choose the folder you sent the job to, normally the Main or Quick folder. Check the job you want to print out, before touching Print Now designate whether you want the machine to continue storing the job or not with the Print and Delete option on the right. That’s all there is to it. 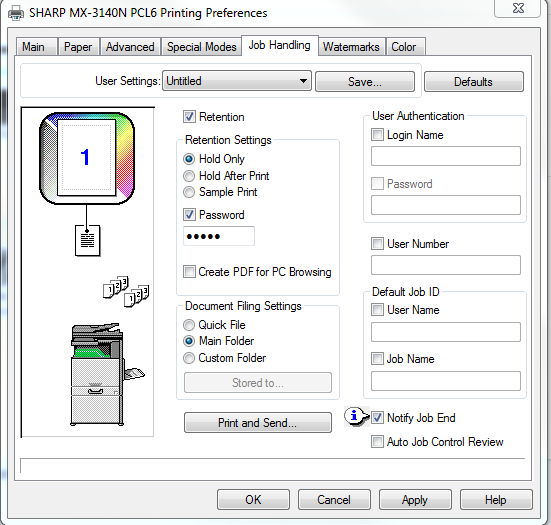 If you have any other questions about operating your Sharp printer feel free to visit the How To Library on our site. There are instructions for accomplishing nearly any task with your Sharp MFP. When you’re in the market for a new or used photocopier in Houston, feel free to request a quote on our site, or call us for a quick conversation so we can recommend one of our Sharp products to you. We offer free delivery, installation, printing/scanning setup, and countless other freebies that make our value the best in Houston. Our service turnaround time is second to none. Contact us today! Hello. i am trying to setup custom folder with password when using document filing. the issue is when i print from my computer it goes to Main Folder instead of my custom folder. i checked the password, re-installing, updating the driver for MX4141N still going to wrong folder. Sometimes it goes to correct folder too. Please advise what else to check or troubleshoot. or this function from Sharp is not so reliable? Thanks. If you default your settings in your printing preferences it should go to the correct folder each time. This is one of those issues that’s hard to say what’s wrong without seeing it. Use our contact form to send me an email and I’ll reply so you can send a screenshot. Hi, i Sent an email already but no reply yet. My trouble is generally Custom folder is working but occasionally some jobs go to Main folder. It is just not reliable. I did restart mfp, re created custom folder. I replied to your comment on the article. I’d recommend contacting a local Sharp dealer so they can take a look in person. It’s hard for me to say from here without seeing how it is setup, etc. Used Retention printing set the password but It keeps telling me that I’m wrong. I am the administrator of the printer. How do I delete the print job since it will not print. Or can I print the job with Admin privileges? 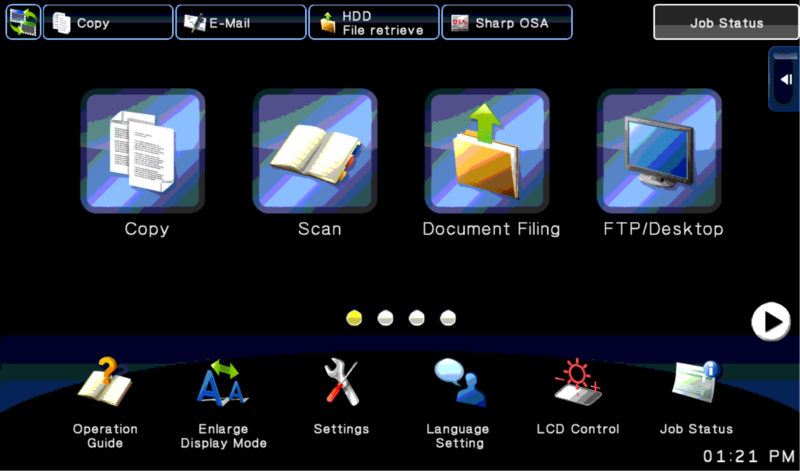 Hi, I have a Sharp M503N printer and I can’t configure a custom folder, I create a custom folder in the website, the custom folder shows in the printer, but in the driver when I select the option custom folder, stored to… it gives me a message: Could not retrieve Folder Names, so I can’t select my custom folder, what I’m not doing ? Sounds like there may be an issue with the printer port. Make sure you’re using a Standard TCP/IP port with the IP address of the copier/printer. A previous employee printed with a secure password several months ago and is no longer here. It is just stuck there. Is there any way to delete the print job so it does not appear in the folder anymore? What model are you working with? I’ll see if I can get you an answer. I too am trying to figure out how to get rid of old locked documents where the owner of the document has either left the company, or does not remember what password was used. I can’t even delete them from the admin interface it seems. Any ideas? We can help you out if you provide a model number. I got the same problem on MX-2314N. Could you please help? I emailed you a link with some instructions. Hope they help you out! In the User Control default settings on the web page there should be a check box that says “Disabling of printing by invalid user.” Check that box and click Apply. Hi, I just want to ask how to put or set up a password code/lock on our printer here in our office (Sharp Printer MX-3114N Model) because of whenever we leave from work, other contractors are using our printer to photocopying. If the 3114 is similar to the MX-3115N then the instructions on this page will step you through how to set it up. We have introduced PP Printing in our office, however there are times where there can be 5-6 documents to be printed. When we try to press select all, none of the boxes are ticked and we are forced to print one document at a time. Is this something that can be fixed so 1 user can enter their password for multiple documents once or do we need to accept that we can only print one document at a time with PP Printing? Hey, I am having some issues when it comes to printing numerous jobs with a passcode for the user. In other words, I have 5 jobs that’s have been sent to the printer, but I am not able to print all 5 simultaneously together after putting the passcode for one job. I have to keep entering the passcode for each job so in this case 5 times to get all the jobs printed. Is there a way to make this easier and more efficient by only having to enter the passcode once and do a batch file of all the print jobs I have sent to the printer? Apu, what model are you working with and how many users do you have? That will help me make a recommendation on the best way to go about this. You need to have at least 5 numerical characters. Thanks for sharing the Guest site list.It is very useful to the new bie blogger like us…This is really an informative and helpful article which I ever have seen. Thanks a lot for your such a big contribution towards the promotion of Guest Posting. Has anyone found a way to force every print job to just ‘Hold’ by default – say in the Quick or Main folders? What I’m referring to is – not in the Driver on each computer – but even when someone just prints to the machine without any particular driver configuration. What I’d like to do is force any print jobs going to it to just ‘Hold’ universally. The manual doesn’t seem to be that helpful toward finding this – they simply point to making changes on each PC’s driver. We are dealing with an EMR software that uses a particular PC’s printer, but ignores all Preferences. It does not care whether you are ‘Hold’ing or password protecting or even trying to force single or double-sided. It just sends the job. We are figuring that if we can capture every job in the ‘Main’ folder and then sort by Username – we can at least have folks distinguish which print job is theirs, rather than have them all just show up (already printed) on a copier. Paul, what model are you working with? I will look into this. This particular one is an MX 465N though we also have a 464N in the office we would like to do this with. I just heard back from the EMR folks again – and they say that they made a change that ensures that ‘username’ gets passed through on the print jobs, but that they don’t have the ability to actually make it “obey” printing preferences. So our best case scenario is almost certainly if we can “catch” every job going to the printer and just force it to hold in a folder. The other part of the catch is that – the rest of the office doesn’t want folks to have to punch in a User # every time they come up to the copier (just to make a copy). If I turn on user Authentication and link it with LDAP, I’m afraid that it will require folks to log on just to make a copy. But again – all that doesn’t matter anyhow if the printer can’t seem to “catch” the print jobs and force them to Hold in a folder. It’s not really a Sharp deficiency – it’s a deficiency of the EMR (it seems). But I figured I would at least put some research into figuring out if there’s another way! Unfortunately all of those type of settings would have to be made within the driver. If the EMR software uses a generic driver I’m not sure how it would work how you want it to. I recommend contacting a local Sharp dealer to do a Document Filing Data clear for you. This is in a service menu and should be performed by a Sharp technician. I’m having a tough time with Sharp MX-2614N. I have a magnetic card reader installed, user authentication set on. I’ve created many user accounts and folders for them, each folder connected to the respective account. All user accounts and folders have passwords on them. Now, authentication using the card reader works like a charm. You scan your card and the printer logs you in, you can go directly to your folder without typing any passwords – super convenient. The problem starts when you want to print something from those folders. I have everything set up in the Job Handling tab – login, password, retention, a proper custom folder to send the files to and the password for it. When I try to print anything, it seems like it lands on the HDD of the printer, because I can see it listed when I access the printer through the browser and go to the respective folder. But when I log in on the printer, it doesn’s show it there! There’s nothing to print. What’s strange, is that when I log in as an admin and go to that folder, I can access the file with no issues, I can print or delete it. Only the user-level accounts can’t even display any files, let alone print them. I have everything set up exactly the same on Sharp MX-M354N and it works perfectly fine, everyone can access files in their folders. I am having an issue with the Custom Folder not sticking in the Printer Preferences in the staff members installed printer. Every time I save the custom folder it reverts back to the main folder and of course doesn’t print. I’ve tested this with many users. Any suggestions? You may try changing it in the printing defaults which is on the advanced tab in the driver. Got it. What should I be changing there exactly as I am trying to set up multiple users to print to their own folder. Thank you. You would need to create Custom Folders in the Document Operations area of the web interface. 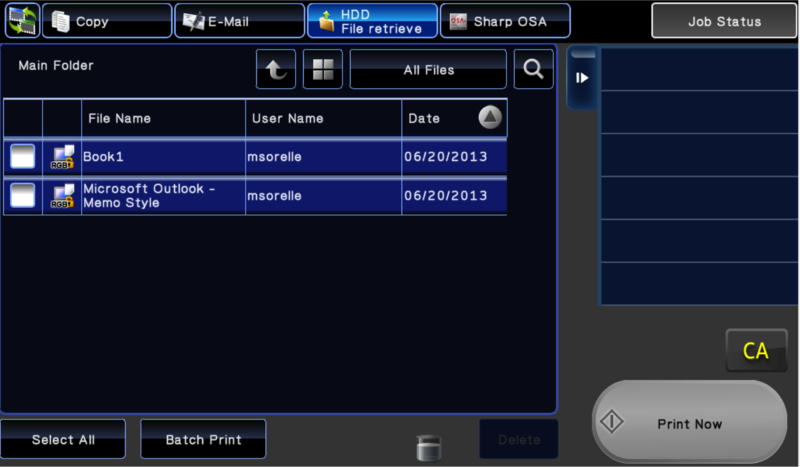 Once you create the folders for the users you can choose them in the driver. I’m also having the problem mentioned above of trying to work out how to remove old documents where the user has left the company or forgotten their PIN. Can it not be done from the admin GUI? Our model is a Sharp MX-3570N.